Maximum Extras - Not all teachers have the same loads, so FirstClass lets you individually set the maximum number of extra classes a teacher can take to cover camps, excursions or absences. This gives you the flexibility to handle extras for part time teachers whose Extras coverage depends on their time fraction. Under-allotments - If you have teachers who, after all their duties have been assigned, are under-alloted, FirstClass can top up their loads with extra classes from cycle-to-cycle. Extra Duties - Include teacher extra duties in the teacher details and they will appear on the printout of allocations and allotments. Emergency/Relieving Teachers - Record your emergency teachers that can be quickly allocated to cover classes for absent teachers. Room Groups - Room groups such as Science Rooms can be configured so the timetable generator does not place more classes of a particular subject than there are rooms available. Teacher/Room Unavailabilities - FirstClass allows you to enter teacher meeting times, part-time teacher days off, etc, so the timetable generator knows these times are unavailable. Consecutive period restrictions can be set up to ensure that doubles do not span, say, a lunch time break. Non-printing periods - Periods can be designated "Non-printing" and can then be omitted from some timetables. Include yard duties on the timetable, but make them non-printing, and only print them on teacher timetables. Security - Set up security for your FirstClass database, with levels of permissions for each user, and each will only be able to make changes to data where it is appropriate. Give general staff viewing and printing rights so they can print their own timetables and lists. When designing FirstClass we understood that in preparing a timetable, the timetabler often has to collect data from a number of sources. To save on the cumbersome and time-consuming task of manually re-keying data that already exists in student administration or internal databases, we have provided powerful import tools that dramatically reduce the setup time required. Any of the following data can be imported directly from text file extracts. If you opt for our "Premier" (multi-user) license, Blocking (student courses) data can be imported from year co-ordinators' databases. It is especially useful to include Blocking data if you wish to give students individual timetables. All this data can also be manually processed using standard maintenance screens within FirstClass. All maintenance screens come with an easy to use layout and standard toolbar. Student subject choices can be imported or manually entered. FirstClass also supports bar coding. Bar coding dramatically cuts the time it takes to record student electives and eliminates the possibility of keystroke errors. The software not only supports bar code readers but also produces customized bar code subject selection sheets! These sheets can be saved from year-to-year. If you don't have a bar code reader, don't worry. FirstClass has many features to ease the burden of data entry. Clever use of drag-and-drop, double clicks, and multiple selects, allows you to make light work of a tedious job. Add students to subjects, or subjects to students, whatever suits you, or the situation. Another unique feature of FirstClass (Premier version) is the ability for year level coordinators to work on their own year level students independently. Each year level coordinator can take a copy of the database and enter their student choices, prepare blocking grids and assign students to classes. Once the data has been entered, just import it back into the central database so the timetabler can set about producing the timetable. FirstClass powerful blocking algorithm takes the manual work out of preparing your blocking lines. Just specify the number of blocking lines and start the generator to produce the best solution possible in seconds. If you have certain criteria, which require subjects to be run in a particular blocking line, you can 'fix' those critical subjects onto the grid manually, and let FirstClass generate the rest of the blocking grid around them. If you already have a pre-determined blocking grid, place all subjects onto the blocking grid manually, and skip blocking generation altogether. If all student choices are viable, your blocking grid will be clash free. If there are problems you can use the clash identification and resolution tools to quickly determine and resolve any issues. The 'Trial Swap' feature allows you to see the number of clashes that would be solved/produced if you were to swap a particular subject with any subject in any other blocking line. Once you have chosen the best scenario, swapping the subjects is as simple as clicking on a subject. The blocking grid and the display of clash numbers will be updated automatically. Other clash resolution features are the 'Trial Move', 'Swap All' & 'Multi-grid Generation'. 'Trial Move' gives you the ability to see the clashes that would be solved/created simply by moving the subject to another line, whilst 'Swap All' trial swaps every subject on the blocking grid with every other subject that is not fixed in place and stores the best solution found. 'Multi-Grid Generation' lets you try all combinations possible for a selected group of subjects within the grid. Once the grid has been finalised you can then assign teachers to the classes on the grid. After the blocking grid has been created, the FirstClass allocations algorithm takes over, quickly and equitably assigning students to their classes. Student allocations can also be made manually, usually for students changing courses. There is an "Enrol Student" screen to cater for new student arrivals during the year and for students who wish to change courses. With the blocking grid complete, and teachers and students assigned to their classes, FirstClass can now transfer this information onto the timetable as blocks. In preparing for your timetable generation you first set up your allocations. There are two types of allocations in FirstClass; blocks and single form class (home group, roll class) allocations. Most blocks will be transferred directly from the blocking grid via the 'Copy Blocks' method, but you may have special blocks not included in your blocking lines and these can be created separately. Once on the timetable the blocks can be amended to include forms, if necessary, rooms or room groups and also teachers, if not previously assigned during the blocking process. FirstClass lets you order the classes in a block to suit your own printing and display preference. Single form class allocations are used for classes that are not part of your blocking lines. These include classes that are conducted as forms such as pastoral care, homegroups and, often at junior levels, core subjects. Now that your blocks and allocations have been finalised, you are ready to see the true power behind FirstClass; the timetable generator. The generator has not only the ability to automatically organise the most cost effective timetable possible for you without any further interaction, but it also provides you with the tools to make your own choices for subject placements if you wish. You may have specific classes that you wish to place manually on the timetable, or your school may have a policy of running sport on a particular afternoon. FirstClass can fix critical classes/blocks into place and generate the remainder of the timetable around these selections. FirstClass uses an iterative analysis timetabling method that, if they exist, quickly identifies allocations or combinations of allocations that are impossible to timetable. You can then make informed decisions about the adjustments that need to be made without compromising your overall timetabling goals. The timetable generator also makes use of room groups that ensure no more of a particular subject runs at the same time, than there are rooms to accommodate them. After the generation is completed, you can then automatically resolve the room groups into rooms. If you still need to adjust, or add allocations to the timetable, FirstClass provides quick and effective tools to move and swap allocations that will have your timetable finished in no time at all. New allocations, whether they are single groups or blocks, can be created at any time "on-the-fly". As most people involved in producing timetables would be aware, generating the timetable is only half the battle. Maintaining the timetable throughout the year can be time consuming, but FirstClass provides the necessary tools to make light work of these daily tasks. Below is a list of the more common tasks associated with maintaining the timetable. Students will often change their interests during the year and wish to alter their elective subjects. Altering the choices and re-allocating the student's classes is a simple process, with plenty of tools to avoid errors. Enrolling a new student is an easy procedure. A single, simple to read screen, allows you to enter the details of the new student, and select their choices from the full blocking grid, which has the current class details displayed. This can be used to alter the choices for existing students. Handling timetable changes, such as staff changes, whether temporary or permanent, is simpler when you have a program that tracks potential clashes for you. FirstClass makes sure that you don't make any mistakes. Often staff changes merely require a change of name. There is a one step process for changing rooms and teachers on the timetable. FirstClass will indicate which rooms/teachers are already being used on the timetable for the period chosen. FirstClass lets you move or swap classes on the timetable, and will show you the potential clashes, if any, that would be created by the change. FirstClass provides a number of group swaps that give you greater flexibility in maintaining your timetable. "Single Period" allows you to swap all classes in a nominated period (on one day) with those of another period. "All Periods in a Cycle" allows you to swap all classes in a nominated period (all days) with those of another period on the same day. "Whole Day" will swap all classes in one day with another. All swap methods will report any issues regarding teacher/room unavailabilities. FirstClass provides an extensive extras coverage, allowing you to make day-to-day changes to your timetable with minimal fuss. Teacher absences can be handled in minutes and extras evenly distributed and recorded across the whole teaching staff. Teacher illness, professional development days, etc, can be entered and the classes that need to be covered quickly identified. To cover the whole load of an absent teacher, in the drag-and-drop procedure, point the mouse at the absent teachers name. Teachers who are not part of your regular staff can be used to cover classes. Simply drag-and-drop them onto the appropriate classes, or teacher name to cover the whole load. Setup camps and excursions ahead of time and determine whether classes can be covered using permanent staff. Teachers who have "lost" classes can be used to cover other classes without cost. Students on these camps or excursions will automatically be recorded as such in A+, our Electronic Roll Marking (ERM) program. If yard duties are included on the timetable, and you need to cover an absent teacher for one of these, you may wish to record this as a fractional extra. Classes can be cancelled any time using this facility on the main Extras screen. However, often a camp or excursion may involve collapsing classes when not all of a year level is out. The Camps facility will determine for you the classes which are the candidates for collapsing. It is then a simple matter of choosing the classes to be collapsed. 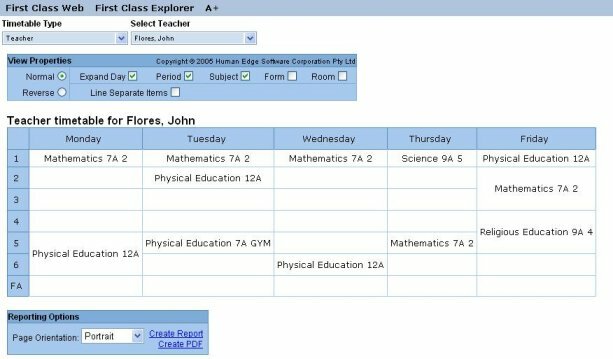 You can create extra classes (eg exams, Maths Comp), and cover those with the available teachers and assign them to the available rooms. FirstClass provides you with a number of methods of disseminating the results. Individual advice slips provide each staff member with a record of extra classes taken. A summary sheet can be displayed in a central location for teachers to determine whether they have extras to cover. FirstClass provides both a detailed history and summary of all absences and all types of extras given. These can be printed and run for a selected date or date range, whichever is appropriate. Histories can be printed by teacher, and you can choose those teachers you wish to print. An important part of the design of FirstClass is the ability to display and report on timetables in a variety of ways. The days of having a single timetable pinned to a notice board are gone. 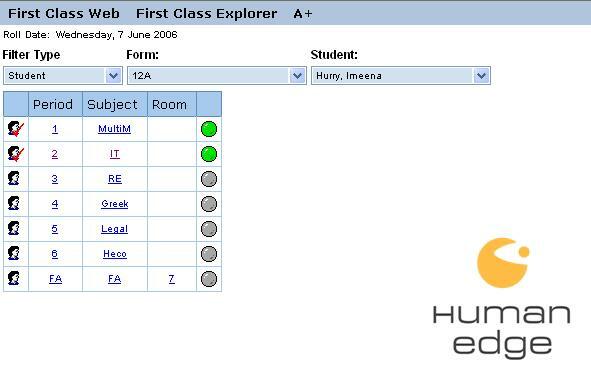 FirstClass can print master timetables, student timetables, teacher timetables, room timetables, form timetables, even emergency teacher timetables. Not only that but all timetables can be previewed on screen. Printing options are endless with users able to select fonts, font sizes, orientation, margin size, and use of short name abbreviations or full names. On top of that all timetables can be exported to Excel if you wish to format or manipulate the data yourself. You can also publish your timetables in HTML format, which simply requires you to republish the data whenever the change is made. This now comes standard in all FirstClass licenses. FirstClass also allows you to publish timetables as PDF (Adobe Portable Document Format) for distribution to staff and students via e-mail or network file servers. "FirstClass Web was an instant hit! One of the biggest productivity gains this year. Staff love it. " "(We) are very excited by it as it will make finding students much easier!" FirstClass Web obtains timetable information from FirstClass. It allows schools to deployment without having to install any FirstClass programs – the browser is part of Windows. Schools successfully place a link for FirstClass Web on the local intranet which allows all staff access to class lists, the ability to search for students and electronic roll marking. Reports can be easily printed or saved as a PDF file. FirstClass Web displays the following features. Timetable viewer displays all timetable information from FirstClass. 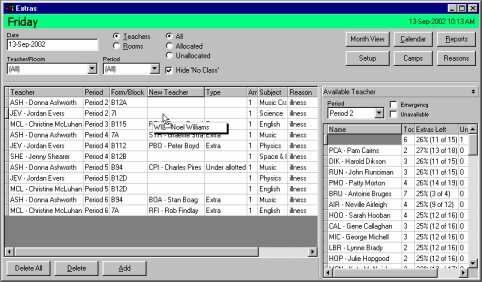 Teacher, student, room, year level, form and the master timetable can be previewed / printed or saved as a PDF file. To look at a timetable, open the "Timetable Viewer" either by clicking on the icon, or selecting it from the "FirstClass Explorer" menu. Explore the many types of timetables by using the filters provided. Note that the same options are available here as in the timetable viewer in FirstClass. View properties within each timetable can be altered. Open "Finder", either by clicking on the icon, or selecting it from the "FirstClass Explorer" menu. 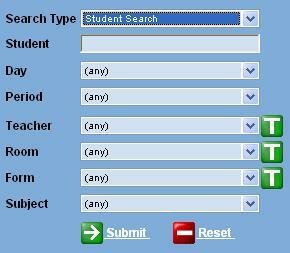 Leave the "Search Type" on "Normal Search" to locate a teacher, or change it to "Student Search" to locate a student. Use just the drop-down comboboxes for the "Normal" search or type in the first few characters from student's names (first or last), for the student search. Use other filters to narrow the search. The next to the Teacher, Room and Form filters will open the displayed item's timetable in "Timetable Viewer". Finder allows for normal or student searches. Entering minimal information in the student row will produce a hyperlinked list . Alternatively, entering additional information will narrow the search for that particular student. A+ Take rolls allows staff to mark their own roll or alternatively, mark the roll for a replacement class. Although the date defaults to current, previous roll can be viewed / edited. Lock down of these rolls is available. Rolls can be sorted by teacher, student or class. over the Web. Once rolls have been marked (or remarking) and saved, absence data instantly updates the database. Changes can be easily made, by remarking the class. Notes on students can also be entered. Staff can access roll marking by use of the Roll Date, Filter Type, Teacher and Class dropdowns. Once a class is selected, clicking the Edit button allows for student roll marking. 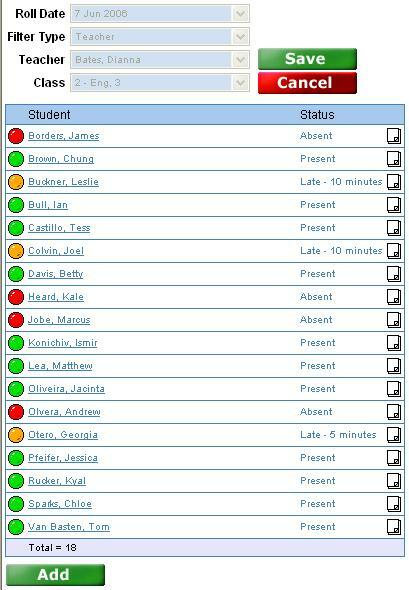 By either clicking on the students’ name for absence or clicking on the coloured circle for additional reasons will allow for absence changes. Students can be added from other classes to the list. Notes can also be added for each student. Rolls can be searched by many filters. Information is tabled and displayed , clearly identifying rolls marked and unmarded for each period of the day. This applies to individual students, rooms and teachers. Roll Searches can be filtered by teacher, room, form or student. In this example, the Year 12 student is present Periods 1 and 2 (indicated by green coloured circle and red ticks). The remainder of the classes for the day have not been marked yet. Why not try it? Simply click on the following link to trial FirstClass Web using a sample database. Student reports include class lists, student choices for checking accuracy, information sheets detailing final subject selection and allocation confirmation. Conflict matrices help you with placement of subjects onto the grid and with identifying why certain student choices cannot be resolved. Teacher/Room Clashes will identify whether assigned classes have caused clashes on the timetable. A very useful report while fine-tuning your timetable. Teacher/Room/Form Allocations, Teacher/Rooms Free and the Teacher Allotments reports allow you to correctly balance your resource allocation. There is a Teacher Free Conflict Matrix which allows you to determine where pairs of teachers are free concurrently. Extras reports include Advice Slips, summary of teacher/form absences and room changes, as well as a summary of class coverage by teacher. Detailed extras cover grid shows the teachers that are absent and the classes that need to be covered. As mentioned with importing of data, we recognise the need to share timetable data with other systems such as administration, report assessment, and attendance software. FirstClass allows for standard text or CSV (comma separated variable) files exports that can be used, but also goes a lot further. Data that appears in a grid format (eg, timetables) can be exported to Excel and the whole database can be copied to an Access database for interfacing to any of your software packages. We also have pre-defined exports for packages such as Markbook, RollCall, CASES21 (more information can be found from the Department of Education and Early Childhood Development, Victoria), VASS and the NSW Board of Studies. This toolkit allows you to access the FirstClass data directly, and can be used for exporting, web page development, reports, etc. You can create your own exports that could be as simple as the rooms a teacher uses, to complex combinations of data for 3rd party programs such as administration software. Scripts can be written in programs as simple as Notepad, up to more complicated programs, such as Visual Basic. Contact us about some sample scripts.